A 43 year-old male was found to be pancytopenic during a routine follow-up. A bone marrow biopsy was performed. It showed myelodysplastic syndrome with increased blasts of 10-20%. Cytogenetic study demonstrated t(3;14)(q26.2;q32) and monosomy 7. 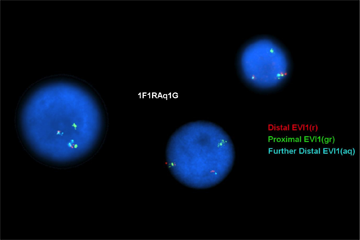 Fluorescence in situ hybridization (FISH) confirmed the t(3;14) to be an EVI1-IGH rearrangement. The patient's past medical history included a diagnosis of acute promyelocytic leukemia (APL) three years ago. At that time, he was treated with all-trans-retinoic acid (ATRA), prednisone and idarubicin, resulting in complete remission. He started three independent courses of consolidation therapy with ATRA and idarubicin. The patient received maintenance chemotherapy with ATRA, mercaptopurine and methotrexate for two years. 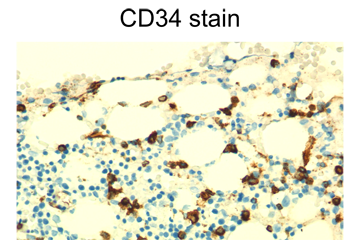 Bone marrow biopsy and aspirate smears showed variably hypocellular marrow, dyserythropoiesis, which was characterized by megaloblastoid maturation and nuclear irregularity, and 10-20% myeloblasts, which was shown by CD34 immunostain on biopsy and by differential count on aspirate smears. Iron stain showed increased storage iron with ring sideroblasts. 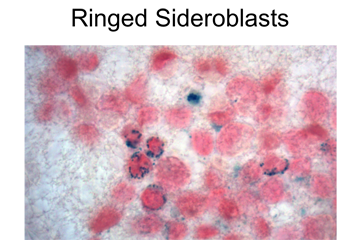 Flow cytometric analysis showed a population of myeloblasts (15%) with the following immunophenotype: CD34+, CD117+, HLA-DR+, CD13+, CD33+. 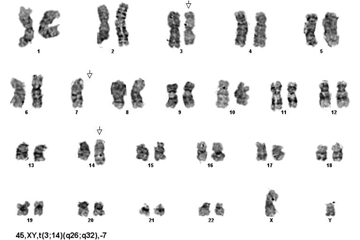 Interpretation: Of 20 cells studied, 13 comprised an ABNORMAL clone with a translocation between chromosomes 3 and 14, breakpoints at bands 3q26.2 and 14q32, and monosomy 7. FISH confirmed the t(3;14) to be an EVI1-IGH rearrangement. 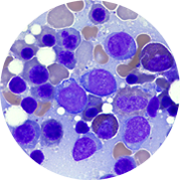 Therapy-related myeloid neoplasms (t-MDS/AML) is a relatively infrequent, late, and poor prognostic complication in patients with APL treated with ATRA and anthracycline-based chemotherapy. EVI1 proto-oncogene is located on chromosome 3q26, and has been shown to be involved in pathogenesis of acute myeloid leukemias or myelodysplastic syndromes. Cytogenetic abnormalities involving EVI1 such as t(3;21)(q26;q22) translocation have been reported as a rare recurring translocation in patients with APL relapsing as t-MDS/AML. 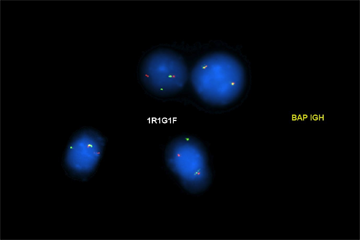 Here, we described a case of a 46-year-old male with history of APL developed therapy-related myeloid neoplasm (t-MDS) with translocation t(3;14)(q26;q32) and EVI1-IGH rearrangement, which has not been reported previously. This case was accepted for discussion by Scientific Review Panel, Society for Hematopathology / European Association for Haematopathology 2013 Workshop at MD Anderson in October, 2013.